Was our ceremony arch from Lowe's? Hell Yes. Sum-up of the wedding vibe: Once in a lifetime mid-century modern tiki dinner party with a ceremony before appetizers. Catering and alcohol, venue, and photographer came in around the same price, and altogether accounted for 75 percent of the total budget. They held equal footing of importance in my book, but the photographer was definitely the easiest to book. I’d been drooling over their photos while trying to gain inspiration, and Michelle at Rad + In Love put me at ease immediately; I knew whatever I was going to be able to pull off would be immortalized perfectly in her work, especially given her extensive portfolio in Palm Springs. Our amazing caterer, Hungry Bear Catering, doesn’t offer tastings for small parties, and they’re based in LA, but their reviews and photos made us feel comfortable taking the bet over going with a bigger, local caterer. The bet totally paid off! They traveled for a minor fee, got Petit Sweets to do the cake, and offered a bartender. Huge win. While I love flowers and could have found a simpler venue to spruce up with them, we opted to go for clean lines and just have some centerpieces from Bloominous to allow the architecture to shine. No bunting, just lots of mid-century modern vibes. 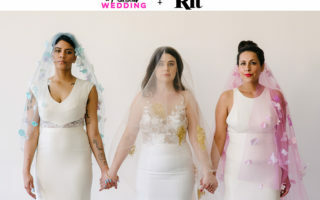 Many online forums showcase the worries of brides concerned their wedding won’t look wedding-y, but I can guarantee if you have a couple of adults saying vows and they’re the fanciest of the party, it’s easy to confirm you have, in fact, attended a wedding. Paper correspondence (menus, invites and save the dates, custom guestbook) took the least amount of money at around $180, but shockingly (to us!) some of the most time. We spent hours looking at what was available in the market to meet our tiny budget and specific aesthetic, but ultimately decided to DIY and agonize to get the look we wanted. It felt very “us” at the end of the day, but if you go this route just know you’ll be up at 1 a.m. formatting images and cursing your decisions. Bohemian Desert arrangements from Bloominous were perfect for both the centerpieces and a bride’s bouquet, and they allowed us customize it to fit our palette. Spending the three months post-engagement just casually looking for inspiration and enjoying each other’s time. A wedding is not a trivial event, and we footed the bill ourselves, so we spent our time researching the costs, components, and market for everything we found essential. The information is empowering so you know how to best stay within your budget. Keeping the party small. Neither of us are great in crowds, amazing hosts, or masochists, so we rightfully kept it super focused, and we were rewarded with tons of face time with our amazing family and guests. Agonizing over tea lights and napkins. Pick one. Close the laptop. Go for a walk. Trying to please everyone. Sneakily ask the parents and closest friends what is absolutely most important to them about your wedding early on, try your damnedest to meet those needs, and let the rest go by the wayside. We didn’t even entertain the thought of making room in the budget for this, but from the other side of the wedding we can absolutely confirm: no one attends a wedding for the free stuff. We bought some used Palm Springs totes and stuffed them with welcome letters and snacks, since our party was so small. For a larger party, I don’t think that’s a feasible effort so soon before the wedding. Buy the APW planner. It’s an incredible resource to help you understand your guests’ idea of “normal,” and then it helps you thoughtfully rebel against the WIC. One of the first tasks you complete is to evaluate the three elements important to you and your partner, and what you want the takeaway to be from your event. Focusing on food, making it minimal and beautiful, and keeping it intimate were at the core for us. Not going traditional wedding dress shopping was a big win for staying under budget. All I knew was I hated lace, wanted white, and had to keep it under $500, so Internet shopping and trying on white special occasion dresses worked perfectly for me. Being in a backyard also took the pressure off—no ball gowns, swans, or cathedral-length veils needed. Finding other intimate, budget weddings to reaffirm what you want and help you out with logistics. Questions like, “Is it weird to ask guests to help move their thirty chairs?” get answered with a resounding, “No, just do it,” and then you don’t feel bad. Our families were very supportive of our tiny wedding and celebrated with us our way. Go for minimum viable wedding, and then only add from there when the addition feels important. Turn off the wedding blogs as soon as you’ve made all your major purchases. No one planning this important and private event should be looking at someone else’s $1 million wedding three months beforehand. Having a wedding! We got exactly what early in our engagement we had agreed we wanted more than to elope. At the end of the day, we never again will be able to look around at our loved ones in one place, at one time, at this stage in our lives. Totally worth it even if it’s just a dinner after city hall (which was our backup plan). The food was ridiculously good. I don’t think a bride has been happier to change into a looser reception dress and have family-style seconds, and all our guests enjoyed the meal so much. Even the (admittedly worldly) toddlers went to town thanks to our caterer’s genius mac and cheese. Jenn’s herniated lumbar disks two months before the wedding. Good thing we never got to those complicated dance lessons! Burglary of most family heirlooms and Clarence’s band from our home two weeks before the wedding (brilliant Clarence hid Jenn’s band somewhere very secret so Jenn couldn’t continue to sneak a try-on, so the theft was thwarted); no one has ever AmazonPrimed a ring so fast. Key immediate family members and close family friends couldn’t attend. Desert Trip (aka Oldchella) announced the week after Save the Dates went out. Accommodations for the whole valley were fully booked within hours. Luckily everyone was able to book something within taxi distance! Bartender’s van broke down on the way to the venue, causing our dear caterer’s partner to step in and shake cocktails. A few friends misinterpreted the invite, several emails preceding the wedding weekend, calls day-of and desperate pleas beforehand, and so managed to arrive… after the ceremony! Planning a wedding is stressful, and life is stressful, but really enjoy the process with your partner. Our collaboration on big decisions was so rewarding when we came in under our budget and not feeling as though we had compromised. Small does not mean easy. There is a minimum set of expectations to having a non-elopement wedding and it includes a couple, probably some rings, a spot for a ceremony, notice of that celebration, and some kind of gathering afterward. Give yourself plenty of time to arrange all of these components and make it true to your values.